July 25, 2010  Many fishermen and their boats are now working with BP in the oil spill cleanup effort, and the coastal waters which provide some of the most productive fishing are still closed. Even after all the oil is gone, it will likely be years before the Gulf fishing industry is as productive as it once was. July 21, 2010  Lawmakers refused to vote on the governor's proposal to put a constitutional amendment banning drilling on the November ballot. The House speaker said the move by the former Republican -- and former drilling supporter -- was more about politics than helping Floridians. July 16, 2010  The site of the Deepwater Horizon explosion in the Gulf of Mexico has been packed with boats and workers trying to stop the spill -- including the Coast Guard Cutter Resolute, which supports helicopters and boats. The leak has been stopped, at least temporarily. July 15, 2010  The Gulf oil spill is hundreds of miles away, but South Florida's marine-park home for dancing dolphins and killer whales is preparing for the worst. The Seaquarium draws its water from Biscayne Bay, and operators are readying alternate sources and oil/gas separators to protect their sea creatures. July 13, 2010  The Obama administration has ordered a new suspension on deepwater drilling in the Gulf. The ban is slated for four months and supersedes a moratorium that was blocked by a judge earlier this month. Some Gulf drilling operations ceased after the BP oil spill, and the question of how soon they can resume dominated Monday's hearing in New Orleans. July 11, 2010  As a legal case over a moratorium on deepwater drilling works its way through the U.S. courts, a Spanish-led consortium is now preparing to sink a deepwater exploratory well in Cuban waters, just 60 miles off the Florida coast. The move raises concerns about how the U.S. could respond in the event of a major spill. June 15, 2010  In a trial being heard in Miami over defective Chinese drywall, new documents show that manufacturers, builders and suppliers knew about the problem with the half-billion tons of imported drywall and did not alert consumers. June 9, 2010  Before the Gulf oil spill, a majority of Floridians supported offshore drilling. Now most residents oppose it. The spill has also helped Gov. 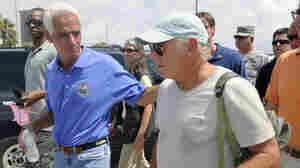 Charlie Crist become more visible as he campaigns for the U.S. Senate. June 4, 2010  Rep. Kendrick Meek's run to be the Democratic candidate for Florida's open Senate seat has been overshadowed by the jousting between Gov. Charlie Crist and conservative Marco Rubio. Now Meek has a Democratic challenger with deep pockets in billionaire Jeff Greene. June 3, 2010  Florida has been working hard to remind potential visitors that it's still a good vacation destination, despite the Gulf oil spill. The state's tourism bureau has been running ads saying its beaches are "oil-free." But with the increasing likelihood that oil could appear off the panhandle by this weekend, Gov. Crist says the state may have to "rebrand." 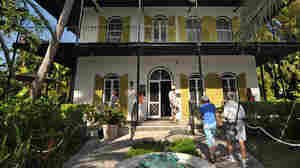 May 28, 2010  After years of being priced out of the market, teachers, taxi drivers and members of the military in Key West are finding houses and condos they are able to buy. Home sales have doubled as prices sank, but the lack of affordable housing remains an acute problem in the resort area. May 17, 2010  It's unclear what Beazer Homes' settlement with Knauf Plasterboard Tianjian means for homeowners. But Beazer used the toxic drywall to build homes in Florida. Last month, a federal judge awarded $164,000 to a Louisiana couple who had the Knauf Chinese drywall in their home. May 3, 2010  Fishermen in St. Bernard Parish are working with BP to lay booms aimed at protecting sensitive coastal areas from the growing oil spill. It's not all happy, though. Some are mad they've not been hired for the good-paying jobs, and everyone is angry and frustrated that their careers and investments may soon become casualties of the growing oil spill.